March 28, 2014, filed under 'POP UP' Camps, SYRIA; No Comments. 9 Million Displaced Syrian’s Must Not Be Forgotten. 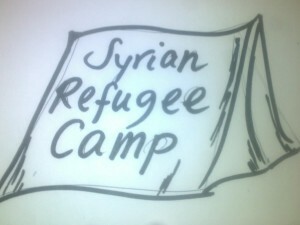 Show solidarity to the Syrian people and support the ‘POP UP’ Syrian Refugee Camp. No need to bring tent as already organized. Bring good energy, banners, placards, tea,coffee. Check weather forcast for brolly alert! The U.N. estimates that over 6.5 million people are internally displaced — an increase of more than two million in just six months. 2.5 million have fled to surrounding countries, Lebanon, Turkey, Jordon, Iraq, and Egypt. This has caused great pressure on the host countries who are in turn suffering from their own internal turmoil. The lack of clean water and sanitation in crowded, makeshift settlements is an urgent concern. Diseases like cholera and polio can easily spread — even more life-threatening without enough medical services. In some areas with the largest refugee populations, water shortages have reached emergency levels; the supply is as low as 30 liters per person per day. Arms companies supply weapons to kill predominantly civilians, in other countries and make an obscene amount of money. The money for the weapons is unwittingly supplied by the taxpayer. Aid is then sent to these destroyed countries to ‘help the victims’ This is the taxpayers money. Charities are then set up to help in the short fall of funds, again this is the taxpayer. The ordinary person in the street unwittingly foots the bill to make people they don’t know and will probably never meet, suffer and be killed, while making someone they don’t know and will probably never meet, VERY RICH. The time has come to peacefully decline. “I hope that those that have the most important responsibility in world affairs will be able to understand that forgetting Syria will be a total disaster,” the UN’s Guterres says.